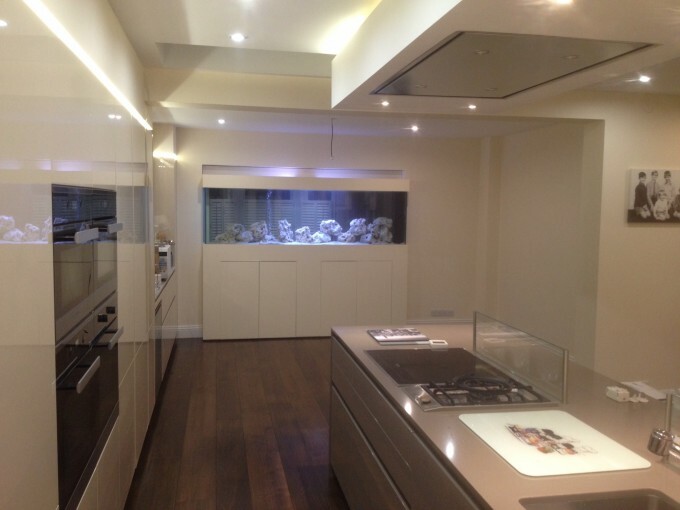 This in the wall aquarium in a newly renovated home in Kew separates the kitchen from the lounge. In this photograph the aquarium had been recently installed and was awaiting its fish. The beauty of an in wall aquarium is that it can be made to look different on either side so that you can end up with a kitchen aquarium and a lounge aquarium in one. This aquarium was delivered and installed on the same day and although it is 240cm in length we were able to deliver it in one piece rather than building it on site which we often have to do with larger aquariums. Our client has stocked her aquarium with a group of Malawi cichlids which are bright and vibrant tropical fish and which many people keep as an alternative to marine fish as they are far easier to keep.